For jan/san distributors, stocking and servicing chemical dispensing systems can provide an easy segue into new markets: Clients with onsite laundry and kitchen facilities often require chemical proportioners that function similarly to those used for janitorial services. With a foot already in the door, distributors can more easily diagnose a facility’s laundry and warewashing needs, potentially winning the customer’s business. 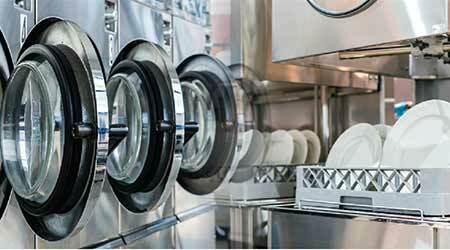 According to Goetz, warewashing and laundry are large, growing markets for distributors to diversify into. The most recent data from Kline, a global market research firm, reports the U.S. laundry chemicals market represents $986 million and the foodservice chemical market represents $2.5 billion a year. Indeed, the healthcare and hospitality industries are two of the biggest end users of laundry and warewashing proportioning systems. Tim Kinser, product and technical manager for DEMA Engineering Co., in St. Louis, estimates that half of the company’s laundry equipment is located in nursing homes, a percentage he attributes to aging Baby Boomers. Hotels account for approximately 30 to 40 percent of DEMA’s sales, followed by smaller businesses and institutions, such as schools, prisons and carwashes. Manufacturers of chemical dispensing equipment agree that warewashing and laundry accounts are good adjuncts to janitorial services. In addition to increasing sales, distributors that diversify into these markets are able to lower costs associated with one of their major expenses: deliveries. “If you get into the laundry or warewashing business, you’re delivering a whole new set of products to the same facility that you’re delivering housekeeping chemicals too,” says Dave Kernes, sales executive for RD Industries, Omaha, Nebraska. Despite the benefits of diversifying into new markets, some distributors are hesitant to make the transition — and rightly so. According to chemical proportioner manufacturers, warewashing and, particularly, laundry are more complex operations that require a greater level of technical expertise.